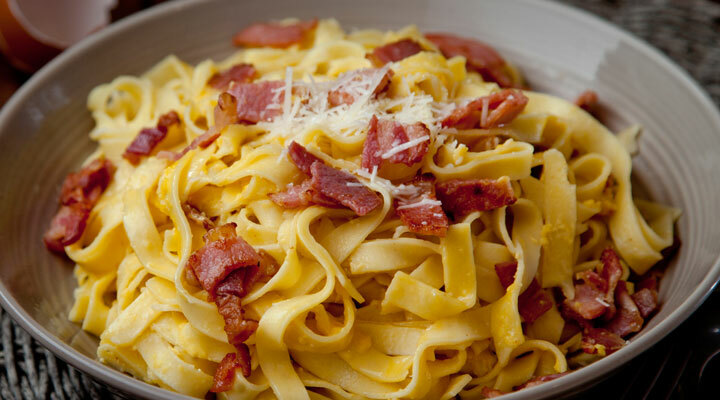 This is a traditional carbonara recipe made only with egg yolk to enrich the pasta dish, but you could add 50ml of cream if you wish. Heat the oil in a deep, wide-based sauté pan and fry the bacon pieces until they’re crispy. Transfer to a plate lined with kitchen paper to drain off any excess oil. In a separate bowl, beat together the Parmesan cheese and egg yolks and season lightly with cracked black pepper. Once the carbonara mixture is ready, bring a large saucepan of salted water to the boil. Plunge in the fresh pasta and cook for 2 to 3 minutes, until it’s al dente. Stir the pasta once or twice while it cooks to ensure it doesn’t stick together. Once the pasta is cooked, drain it and return it to its saucepan, off the heat. Add the bacon pieces, then stir in the egg and cheese mixture. Combine gently to ensure the pasta is fully coated. Serve immediately in warmed bowls and sprinkle with a little extra Parmesan cheese if you wish. Season with extra cracked black pepper as required.